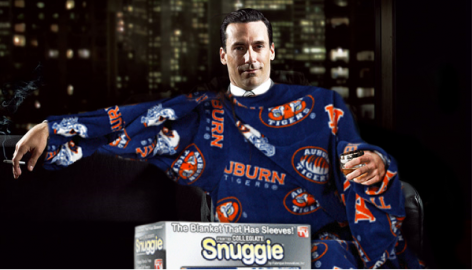 What you call the Auburn Family was invented by guys like me to sell Snuggies. You know a television show has you when the prospect of going without it for what will be nearly a year and a half leads you to forage for its fantasy not in the Twitter accounts of the actors behind the characters but in the make-believe social networking of fans pretending to be those characters*. And that’s how I found out — take a good look — that the man with one of the most enviable, dapper Twitter handles in the world is an Auburn man, an Auburn man named Don Draper. From his Twitter bio we know that @dondraper is an “Entrepreneur, Software Developer and Business Owner” (which is totally how the fake real Don Draper’s Twitter bio would probably read). 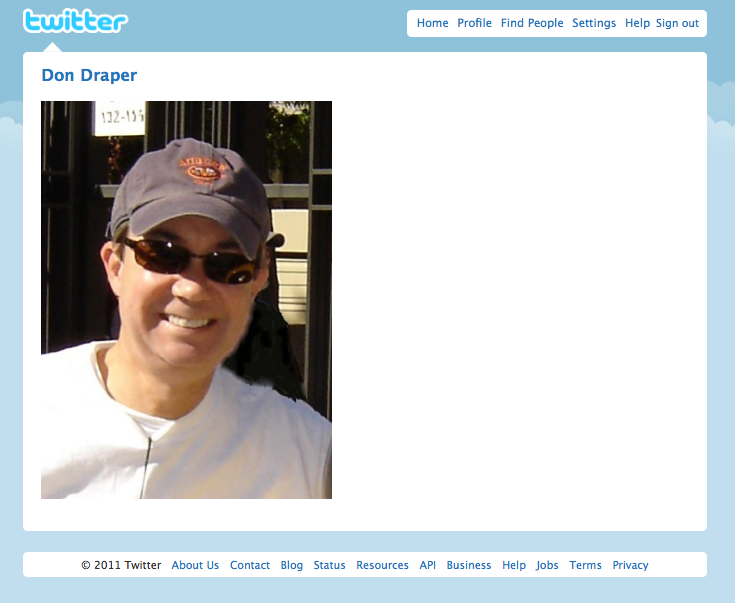 The meatier stuff is found on his webpage — yes, Brother Don also owns www.dondraper.com. Married with two kids. Two degrees from Auburn in Medical and Laboratory Technology. Taught himself programming on the Radio Shack TRS-80 and the Apple IIe. 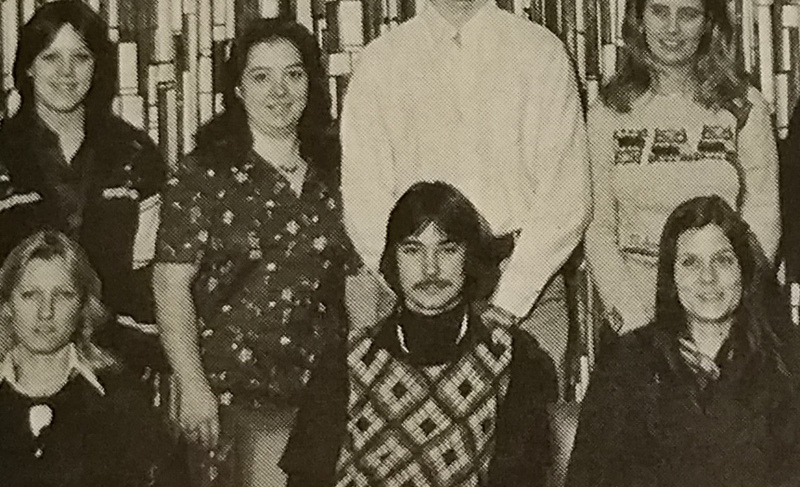 Don Draper (mustache) was a member of Lambda Tau, Auburn’s medical technology honorary, in 1978. What can’t be found on his webpage is a single mention of dog-tag identity theft, Joan’s curves, Peggy’s softly flourishing feminism, Pete’s smarm. Nothing. There’s not even a “no, this isn’t a Don Draper fan page” disclaimer for the God knows how many Mad Men fans who have surfed his way in search of Hamm’s chiseled jaw. Presuming it impossible someone so net savvy could be culturally sealed off from references to the addictive drama at Sterling Cooper (Draper Price) — and judging by his lack of response to my emails and voice mails asking to discuss the coincidence — I’m forced to conclude that Don Draper likely deems his fictional namesake a complete and utter curse. But he shouldn’t. Sure, everyone frets over a real life “no-talent @$$-clown” hijacking their sense of self; I’m currently competing for Google’s affection with a “home business mentor,” a B-list MMA fighter, and an obscure British skateboarding legend. But how many of us get to own an introduction like a freakin’ Randian ubermensch? The name’s Draper… Don Draper. War Eagle. No doubt — we Auburn men can count only what we earn. But that doesn’t mean we can’t enjoy what we haven’t. That’s pretty much Mad Men in a nutshell, actually. *I was actually first introduced to this phenomenon by a friend who interviewed — via Twitter, supposedly the first Twitterview of note ever or something— the woman behind @PeggyOlson immediately after she walked off stage at the 2009 Shorty Awards. Don Draper in Auburn Snuggie graphic by The Auburner’s great Mark Paden. Related: Don Draper on meeting Bo Jackson: ‘Terrifying’. Thanks for revealing the mystery behind the real Don Draper! I’ve always wondered. But what a great conversation starter to have the same name as a dapper, debonair (and occasionally dastardly) TV character.